A year ago the builders moved in where we live. They renovated everything on the outside of the building. We got new insulation, new blinds, new coats of paint, new everything. I saw the builders every day, I got to know them and they got to know me armed with my camera. I was taking photos everywhere, they would see me coming and even strike a special post. Eventually I had more than one thousand photos. There are always those photos that you never forget. One day something had to be repaired and a new layer of concrete was necessary. 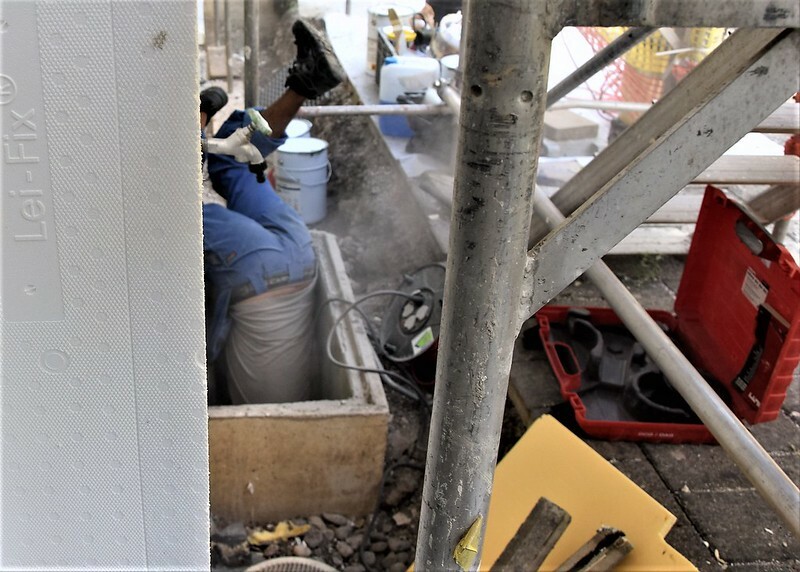 This was a difficult job as it was deep down, but our builders had a solution for everything, and this was a photo I took that really put a smile on my face. The builder survived. Tomorrow is poisoning day here at the ranch. The dogs are going into day care and we are going — well — it depends on the weather. If it’s nice, we’ll go take pictures. Not so nice? I guess … the mall. We NEVER go to the mall. But we have to be away for four hours, so we need to go somewhere. Soon, we too will be under construction. This is all giving me a headache.